A large monastery like Bury St Edmunds needed good organisation of all aspects of its operation. The duties of abbots and monks and the supply of needed items were governed by a customary, a book which set down the distribution of work and the apportioning of food and other necessities. Made for the abbey of Bury St Edmunds, this customary gives a vivid picture of the variety of people who lived and worked at the monastery. It shows also how the monastery maintained moderation--avoiding extreme severity--and accommodation of the needs of the elderly, ill and those who performed heavy labour. Bread was allotted to monks and servants alike according to the kind of work they did, providing they were not ill or elderly. On this page, allowances of bread ('panem') are given for categories of labour. 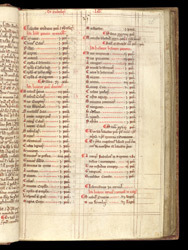 Among those in the first column, scribes (scriptor) and painters (pictor)--some of whom made this manuscript--are allotted one panem per day. Others listed include messengers, squires, butlers, caterers, janitors and stable hands, some of them in groups. The nuns at Theford ('moniales Theford) were given thirty-five units of bread.